Envelopes are a crucial component of corporate identity and can be accompanied with a formal letter for direct-mail advertising or used for day-to-day correspondence. Whether you are mailing a letter, an announcement or a brochure, showcase your logo and company information for maximum exposure. Personalized envelopes attract the immediate attention of the reader or the customer even before they reach for the letter opener! Please note that there is possibility of up to 1/16" shift on the envelope die cuts. Envelopes are printed flat with full bleed, then cut, converted, and glued. This way, you're able to customize your envelope with full-color flaps and panels. Note: We do not print on the inside of the envelope. We offer 70 lb. Offset Opaque Smooth White paper for both envelopes and letterheads for a matching and professional stationery package. We do not recommend using dark, high-density colors (black, purple, blue, brown, etc.). Dark colors tend to get soaked into the paper if their color values are too high, and may cause offsetting. For best results, use lighter colors. Since our envelope paper stock is uncoated, you can easily write on your envelopes or use them in your Laser or InkJet printers for customization. Our envelopes are available in multiple sizes to fit various promotional and personal items, including letters, announcements, invitations, cards, brochures, and folded leaflets. Please refer to our downloadable templates to ensure you have the proper bleed. Please leave the No Ink Zones blank, as glue will be applied to these areas. Before customers view your letter or announcement, they notice the envelopes that hold these documents. Make a great first impression by choosing quality envelope printing from Kinetic. Envelopes are more than just paper holders: They provide another medium for you to showcase your company's commitment to quality. When your envelopes match the rest of your printed materials, potential customers develop a clear understanding of your brand's identity. Customers choose Kinetic custom envelopes for many different reasons. Corporate clients love using our mailing envelopes for large projects, and brides trust our company to deliver envelopes for their save the date cards and wedding invitations. Others select our high-quality, attractive envelopes to send out greeting cards or event announcements. However, we also offer a variety of other specialized sizes for unique purposes. Ship your catalog in our large 9" x 12" envelope, or mail a booklet using the 6.5" x 9.5" size. Kinetic also offers window envelopes in 3.875" x 8.875" and 4.125" x 9.5" sizes for commercial use. You will not have to worry about flimsy envelopes that tear easily when you order mailing envelopes from GotPrint. All of our envelopes are printed on 70 lb. Offset Opaque Smooth White using high-quality, full-color offset printing. Our full-bleed printing allows you to add eye-catching colored panels and flaps, and all envelopes except those with a window are compatible with both laser and inkjet printers. Kinetic offers three options for envelope creation and ordering. If you already have an envelope design ready, use the Upload Your Design feature to add your creation, choose a quantity and other options, and place your order. If you prefer to use one of our envelope templates, click on the Online Designer option, select your envelope size and design your envelopes. You can change everything from font size and type to colors, and you can also add your logo or use one of our graphics. Even if you have never designed an envelope before, you will find that the Online Designer tool is user-friendly and easy to use. 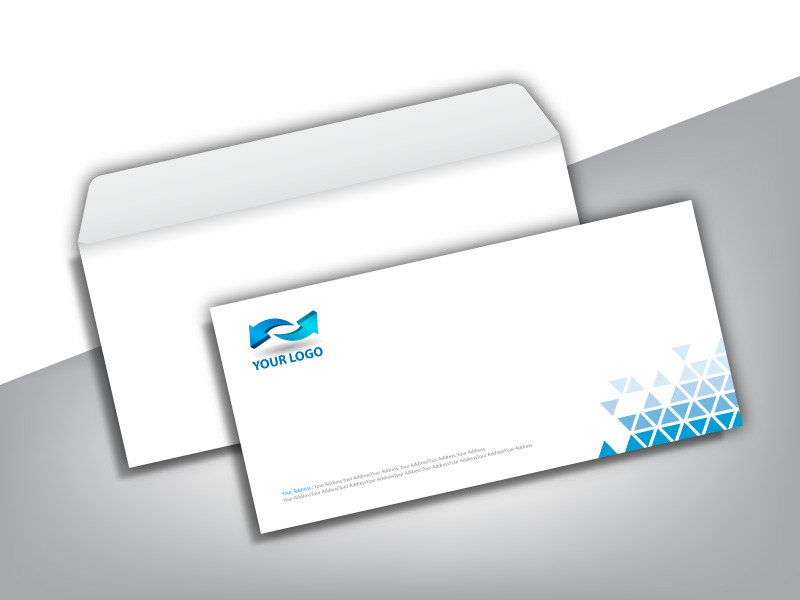 We also offer design services for those who want to have their envelopes created by one of our professional designers. At Kinetic, you will not have to break your budget to take advantage of professional design talents. Design service costs start at around $50 for custom envelopes, and this fee includes revisions to ensure your satisfaction. Regardless of the design method you choose, you will be able to view a clear online proof before finalizing your order at GotPrint.com. Thanks to our intuitive software and design tools, you can customize your envelopes, approve the design and place your order without wasting any time. Kinetic offers guaranteed turnaround times and quick shipping for all orders. In most cases, turnaround time for custom envelope orders is less than one week. Our envelope printing services were carefully designed to meet the needs of our clients, and our friendly customer service team is here to help you every step of the way. Kinetic is committed to earning your business and ensuring your satisfaction. You can place your next envelope printing order with confidence because of our competitive pricing, customer satisfaction guarantee and excellent finished products.